Facilitate off-bottom commercial oyster farming operations. Each of these, especially those dealing with restoring and expanding public oyster reef habitats, begins with baseline surveys of actively harvested public reefs. 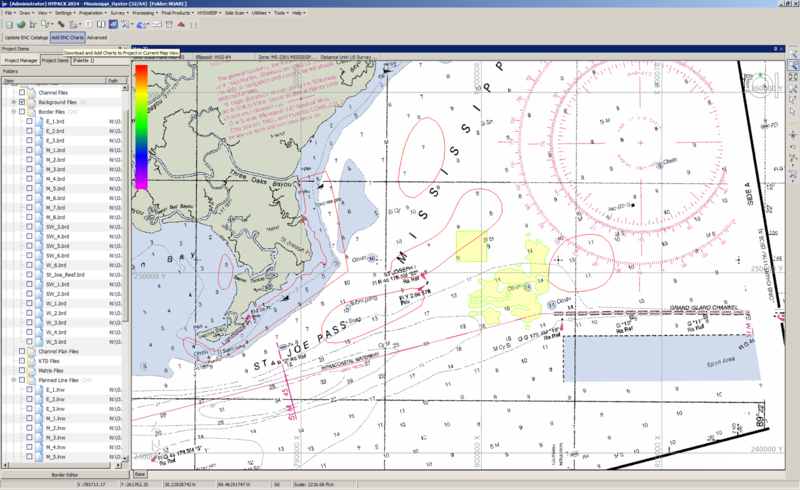 Precisely delineated and precisely located, these surveys must provide reef spatial extent, reef topography, reef volumes, and adjacent reef substrates in a cost effective manner. Historically, large-scale shallow water survey projects using traditional hydrographic survey techniques have proven to be expensive and time consuming. We are working on applications for oyster habitat, artificial reefs, and shallow-water navigation channels mapping and monitoring with new environmental monitoring technologies associated with Phase Differencing Bathymetric Sonar (PDBS) systems. PDBS systems provide a significantly wider swath of useable bathymetric and side scan sonar data in shallow water (less than 35 meters) compared to traditional multi-beam echo sounders (MBES). In addition, PDBS systems offer a platform for providing simultaneous, co-registered, three-dimensional (3D) bathymetry and side scan sonar imagery in a single unit. Co-registered data collection deployed on unmanned maritime vehicles is central to satisfying long term, cost effective concepts of operation for large scale shallow water surveying. Our anticipated outcome is to provide an oyster habitat and shallow-water navigation channel mapping capability deployed on unmanned maritime vehicles that save our public sector stakeholders time and money. St. Joe Reef, near the coast of Hancock County, Mississippi, was recommended by DMR resource managers as the test site for demonstrating the new methodologies for oyster habitat mapping described in the Governor’s Oyster Council Report (June 2015). This site is an actively harvested reef system and has undergone reef replenishment with applications of cultch material. The reef topography is diverse with reef depths ranging from 12 to 18 feet. Data was collected with the EdgeTech 6205 interferometric swath bathymetry and side-scan sonar system. This example of raw sonar imagery, collected at approximately 3-inch vertical resolution, depicts the spatial configuration of the actively harvested reef. The illustration is referenced with a 100-meter grid overlay. Precision bathymetric measurements are simultaneously co-registered as the system operates over the reef habitat. The following images illustrate these data acquired with the unmanned vessel, C-Worker 6. The bathymetry data shown on the top image was collected at 0.10-foot resolution (for reference the dark blue represents depths of 20 feet). 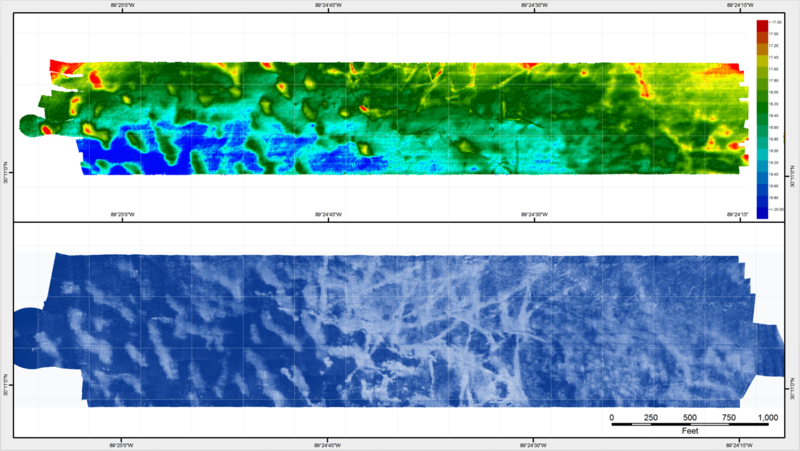 When compared with the sonar imagery shown on the bottom image, the preliminary results are very encouraging. In subsequent applications research projects, we will prove replicable measurement methods for oyster reef habitats to accurately measure (1) Pre- and post-harvest reef configurations, (2) Effects of reef enhancement/restoration efforts, and (3) Long term change to determine reef sustainability. Our work will focus on operational equipment settings, operating procedures for the mapping system integrated with the unmanned vessel, and documenting the baseline system configuration for optimum data quality, error analysis and replicability.